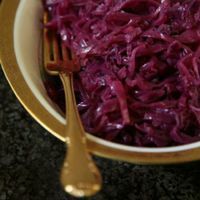 The secret to cooking this dish, a classic German accompaniment to a hearty meat course, is in keeping the pot covered, which helps preserve the cabbage's deep, purple hue. This deep, purple dish is a classic German accompaniment to a hearty meat course. Cook bacon in a large wide pot over medium-high heat until just crisp, about 5 minutes. Add sugar and cook, stirring constantly, for 30 seconds more. Add onions and salt and pepper and cook, stirring occasionally, until onions are golden and soft, about 10 minutes. Stir in apples, reduce heat to medium-low, cover, and cook until tender, 6-8 minutes. Add port, vinegar, and cabbage to the onion-apple mixture; stir to combine. Cover the pot and cook until cabbage is bright purple and slightly wilted, 5-7 minutes. Add stock and salt and pepper. Increase heat to medium-high and bring to a boil. Reduce heat to medium-low, cover, and cook until cabbage is tender but still red, about 1 1⁄4 hours. Stir in red currant jelly, season with more salt and pepper, and cook briefly, 4-5 minutes more. The village of Coquí in northwest Colombia is experimenting with sustainable agriculture and business models to preserve the community’s future. Thanks to a new wave of Vietnamese-American entrepreneurs, a movement to change the perception of Vietnamese coffee is burgeoning in the U.S.
A touch of sea salt intensifies the flavors of this shaken Vietnamese iced coffee. A nourishing, rustic Italian dish somewhere between a soup and a pasta, pasta e fagioli is a traditional meal worth incorporating into your repertoire. Italy's simple but comforting pasta and beans recipe is a classic for a reason. A traditional celebration centered around sweet pastries, crêpes, and breads, Mimouna marks the end of Passover fasting in North African Jewish culture.